Displayport to DVI 24+1 cable connects your devices with DVI connectors, such as external monitors/projectors/plasma/LCD TVs, easily to devices with a DisplayPort connection, such as PCs (graphic cards)/notebooks/Blu Ray players, and many others. Supports video resolutions up to 1920×1200 / 1080P (Full HD). 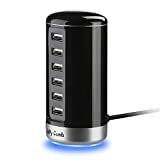 Easy plug & play installation – A single cable for direct connection, no additional adapters required. And no driver or software installation required . Low-profile connector does not block adjacent ports on your computer, has molded strain-relief for long life, and has ergonomically designed treads for easy plugging and unplugging . 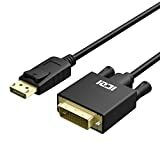 DisplayPort Male TO DVI Male Adapter? ICZI Displayport Male to DVI Male cable offers you a one stop solution to connect your old DVI displays, Monitors, projectors, TVs to your new Displayport Laptop, PC, Graphic card. It can support displays of up to 1080p HDTV or 1920 x 1080 PC graphics and is ideal for your office, home entertainment display, conference rooms, and more. – HDTV resolution supported: 480i, 576i, 480p, 576p, 1080i and 1080p @60Hz. – Bandwidth: Up to 1.65Gbps per channel (4.95Gbps all channels). – Only convert signal from DisplayPort to DVI , it is not a bi-directional adapter.